There hasn’t been much glory for United lately. They lost to MK Dons 4-0 on Monday. 4-0. And to add insult to injury, the United players are forced to wear shirts sponsored by “Chevrolet.” So the “Chevrolet” logo is right there on each player’s chest, visible for everyone to see. Chevrolet. Not only is the shirt now ugly but it’s an ugly act of gloating by United owner Malcolm Glazer, who was born and raised in Rochester, New York. The Rochester, New York in the United States of America. Do you remember the Chevy slogan that ran from 2004 to 2009? That was the “American Revolution” advertising theme. American Revolution, as in, the Revolutionary War. Don’t be fooled by that new Chevy Man U commercial. Chevy is one of the most American of automobile brands. Just look at any of their other commercials. There’s always a cowboy riding a horse or a woman cooking in the kitchen or NASCAR or little league baseball at dusk. Wayne Rooney is one angry Redcoat. For patriotic Americans, United’s kit is a revelation. And for patriotic American soccer fans who dislike Manchester United, their ugly Chevy jerseys are more beautiful than fireworks on the 4th of Ju-ly. Bravo, Malcom Glazer, bravo. But maybe you should have gone all in and made Dodge the sponsor. One theory circulating amongst car commercial theoreticians is that “Maddie” the dog is really a metaphor for the Manchester United soccer team. From the present vantage point, it looks like her best years are behind her. Most people, when they see her, will make comments like: She doesn’t have much pace anymore, does she? She seems to have gotten lazy. Where did all of her energy go? Her flair? She used to be such a great dog. It’s sad what time can do to an animal. Or a soccer team. Luckily the United players still have their fans who—like the owner of a once-adorable golden retriever—become so attached during the prime, one might say winning, years that they still love their “Maddie” during the rougher times. Looking back at the glory days helps too. The big question now is whether United’s addition of star midfielder Angel Dì Maria from Real Madrid is like giving “Maddie” painkillers or more like getting a new, younger, faster, better dog altogether. If Monday night’s loss is a sign of things to come, United fans are going to have to hope for a new dog real soon. Or extra strength pain killers and lots of ’em. The team’s problems start in the back line where Johnny Evans gifted the Dons their first goal with a terribly sloppy pass and Anderson made little effort to defend the second. The giveaways by United players in the middle of the pitch were unforgivable, particularly against a low caliber team. If they play this way against higher quality competition, scorelines could be worse than 4-0. MK Dons players roamed freely between the United backs and defensive midfielders, and Benik Afobe took advantage of lackluster defense on his two expertly-taken goals. 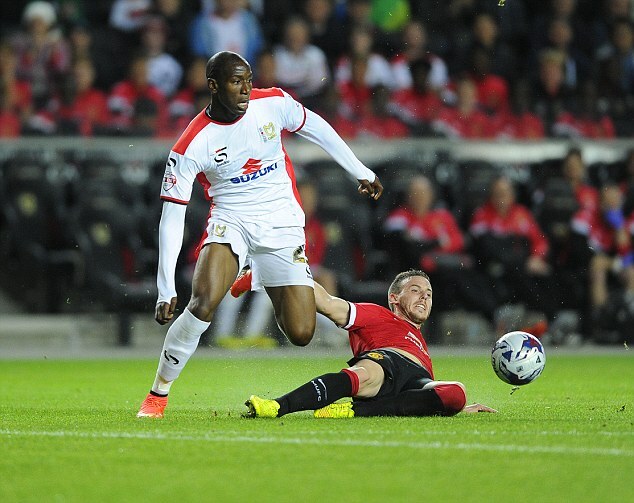 Afobe on the run, United on the ground. In their first three matches of the young season, it’s looked as if the United players believe that they deserve to win each time, even if they don’t play well. But you have to play well every day in England if want to win. Every team is hungry, whether it’s Manchester City or Swansea City or a team that hasn’t played in the Premier League since 2000. Back at the turn of the current century, Milton Keynes was called Wimbledon FC and finished 18th while Manchester United won the Premier League 18-points ahead of the second place team. That’s what Manchester United do. They win. But if they’re going to put together a season respectable in the eyes of their fans and in light of their whopping $165 million payroll and star-studded lineup, they’re going to need, dare I say it, a revolution. Angel Dì Maria, fresh off a Champions League Final victory and World Cup Final run, seems to be expected to single-handedly turn things around at Old Trafford, but is another star left winger what the squad needs? Sure, Dì Maria is a lot better than Ashley Young and will likely link-up well with Juan Mata, Rooney, and Van Persie, but this isn’t actually the big change United fans might expect it to be. The move is probably what they want, but it’s not what they need. What they need is top quality defenders and holding midfielders who can keep the ball and pick out passes to the talented attackers. This is a top-heavy team whose top hasn’t gotten a chance to shine this season because of how badly the bottom–the back line in this case–has played. Look at the two best teams in the Premier League so far this season. Chelsea and Manchester City both play four at the back, and both have supreme class in those positions, players that knock any United line out of the water. Any coach would much rather have Chelsea’s Ivanovic, Cahill, Terry, and Azpillicueta than Louis Van Gaal’s great 5-at-the-back experiment, which is apparently not transferable from sunny Brazil to sodden old England. 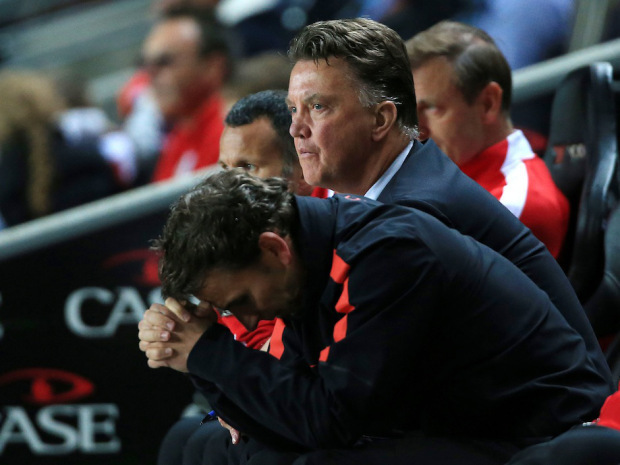 In his postgame interviews, Van Gaal is looking older and older by the match. What was that Albert Einstein quote about insanity? Something about doing the same thing over and over and expecting different results? Well, the Old Trafford Overlords won’t put up with too much more insanity, not even from the manager who orchestrated a 5-1 Dutch thrashing of Spain in the World Cup. Unless Di Marìa is the magical missing ingredient to Van Gaal’s game plan, the formation will have to be scrapped, the team will have to play a more traditional 4-4-2, and obtaining talented defenders will have to be the club’s top priority. At least it can’t get any worse for United. It really can’t. And it won’t. But it likely won’t get a whole lot better either. The club in its current form simply lacks the class it once had on tap like PBR at a college bar. It wasn’t as cheap as PBR of course, but it was as regular. You could count on seeing Ryan Giggs, Paul Scholes, Michael Carrick, Rio Ferdinand, Nemanja Vidic, Patrice Evra, and Rooney on the field every day, and they were good every day. They defended and attacked together, and they were dominant. This team is nowhere near that level and with most of those guys retiring—Giggs now appears to be Van Gaal’s Mancurian English translator on the bench—or transferring out, it will take a lot more than Angel Dì Maria for United to become winners again. United fans should be prepared for a disappointing campaign and should celebrate a late season fight for even a top six spot, if it comes. United are a baaaaaaaad team and not in the good way. It’s now time to see if their dynasty will be followed by another from their crosstown rivals or if any clubs from London or Liverpool can produce perennial championship runs. 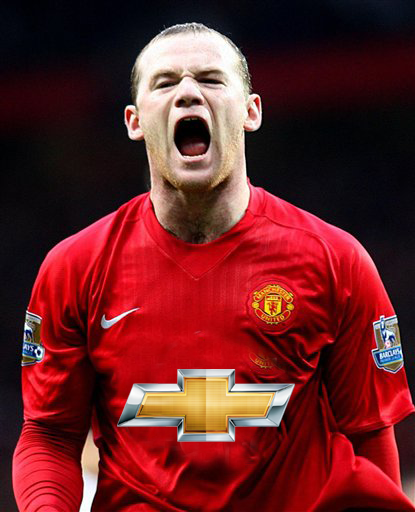 The Premier League is a mither this year, and that’s a good thing for everyone not wearing Chevrolet red. Next Match: At Burnley on Saturday at 7:45 AM EST. Needless to say, this is a must-win for the Red Devils.